It's not hard to find a good cup of coffee in Stockholm (despite our lack of Starbucks), nor a good cup of tea. Finding a good proper Afternoon tea however, is a little more difficult. Luckily my friend Pia is always up for trying out various places, and when we celebrated that she's started a new company, we decided to splurge for one of the most luxurious ones: at Cadierbaren, Grand Hotel. Tea is a whopping 358:- SEK, but I still felt it was well worth it. The tea itself was delicious - and unlimited, at least they gladly brought a new pot when we ran out. And the sandwiches, scones and desserts were really top-notch. We got four sandwiches, and while I don't remember all of them, I did love the cucumber-egg and most of all, one with avocado and fresly made pesto. Delicious! Next, two scones - one regular, one with bran flakes - served with browned butter, whipped cream, a most gorgeous passion fruit curd, vanilla cream cheese, and a gingery ruby grapefruit marmalade. And to finish, four mini desserts. 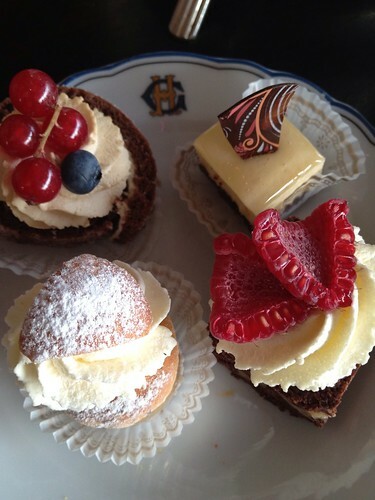 One little semla, a lemon cheesecake, a chocolate jelly roll with coffee butter cream (very very yummy! ), and a rather stodgy walnut brownie. Needless to say, we were quite full afterwards! Sounds (and looks) amazing! In the states (Pacific NW at least) we have quite a few places to have tea. But most of my favorite teas have been in British Columbia, Canada. Hi hi This si looking good, Nice blog you have.